If you can capture one of your opponent's stones that may be a good thing to do. Play to strengthen or increase the liberties of your weaker stone. If possible, don't strengthen or give your opponent good shape. Now the black stones , , and are separated from by the white stones. It is White's turn. All of her stones look weak and she can't capture any black stones immediately. 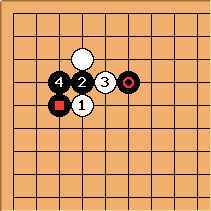 Both of the marked places are joseki moves. Black's three marked stones in the next diagram are "inside" and short of liberties. They need help. in the next diagram strengthens these three stones and then strengthens the three weakened white stones. The two black stones on the outside now are the weakest black stones and need attention. 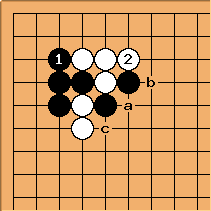 Moves a, b, and c, helping them and/or putting pressure on White are all possible joseki moves. 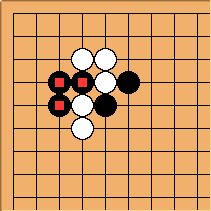 The discussion of this joseki based on the tactical principles mentioned above could continue for several more moves. A similar analysis could be made of many complicated tactical situations in the middle game, though there things may be even more complicated. Perhaps thoroughly understanding the crosscut can help us in many different tactical struggles.